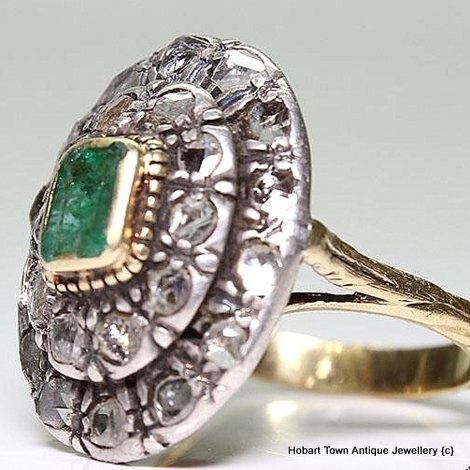 This Stunning Antique 1.25ct Colombian Emerald Diamond 18ct Gold Ring c1820 is yet another fine authentic Georgian ~ early 19thC ring that is 100% original and becoming rarer by the year ….. especially at this price! 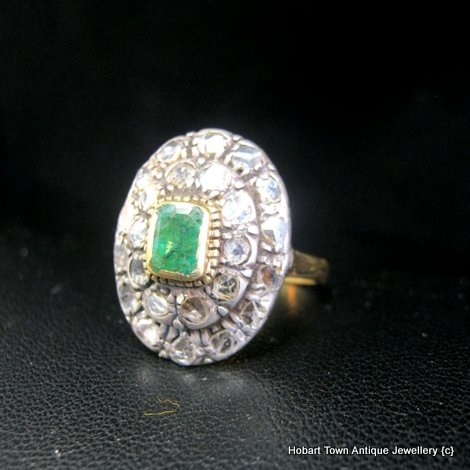 Genuine , Rare & Stunning Antique 1.25ct Colombian Emerald Diamond 18ct Gold Ring c1820 /30’s in excellent Original condition >>>>>>>>>>> All the way from the reign of George the 1Vth ~ c1820/30’s. 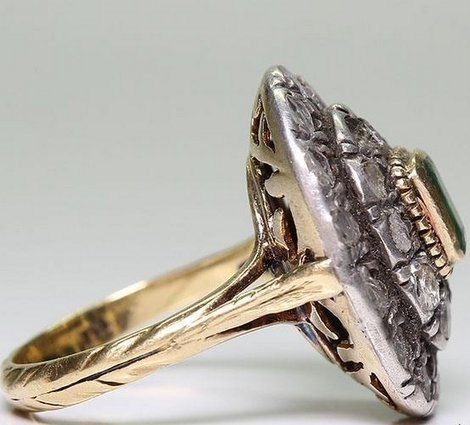 What a classic Georgian early 1800’s ring of superior quality & beautiful design ~ an absolute stunner! 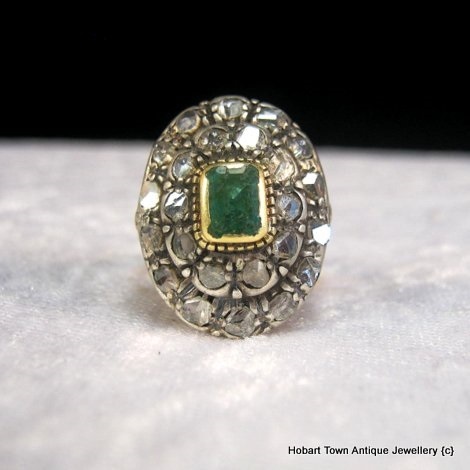 Neo Classical jewellery is extremely sought after & has been for many years. 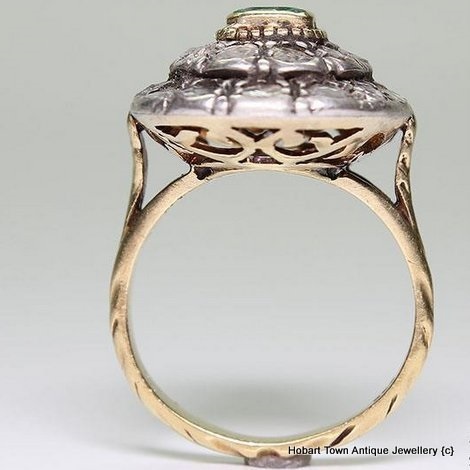 With this gorgeous ring having a strong Neo Classical appearance ~ I would be very surprised if this ring was not enjoyed by a large percentage of ladies that view this charmer and appreciate true antique jewellery! Please bear in mind that although this is not a ring of small dimensions ~ the models hand on this occasion is quite small / petite. 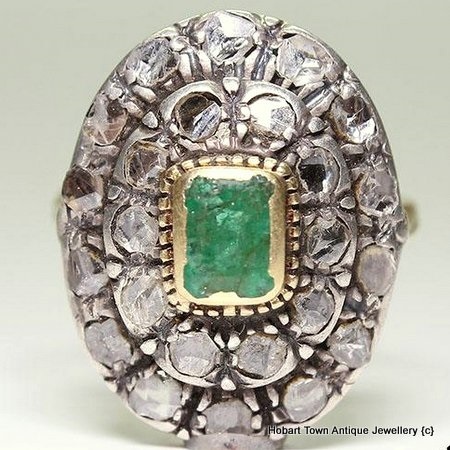 With such a beautifully coloured natural emerald being the centre stone & such ‘obviously antique’ diamonds ~ this is one gorgeous 200 yr old Georgian ring! 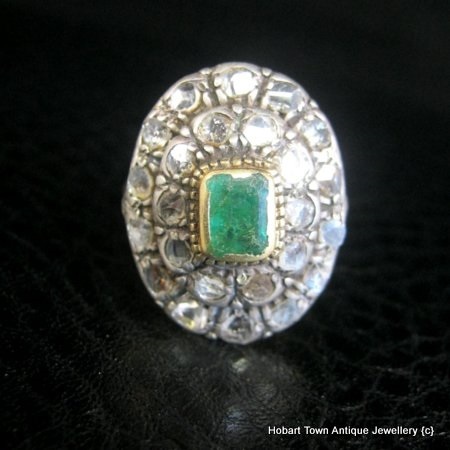 SIZE/S:~ Weighing in at just under eight grams , this surely is one solid , well made & heavy ring of substantial size and gem weight & being a U.K. or Oz size “N” or U.S. size “7” & with no issues re-sizing to what ever size you require. 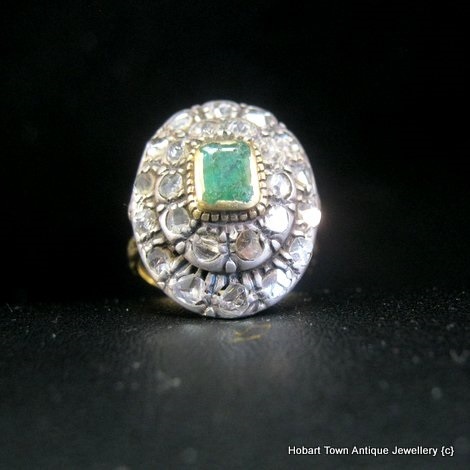 Yet another ‘box ticked off successfully’ with this Superior Quality Emerald & Diamond 18ct Gold Genuine Antique Ring. 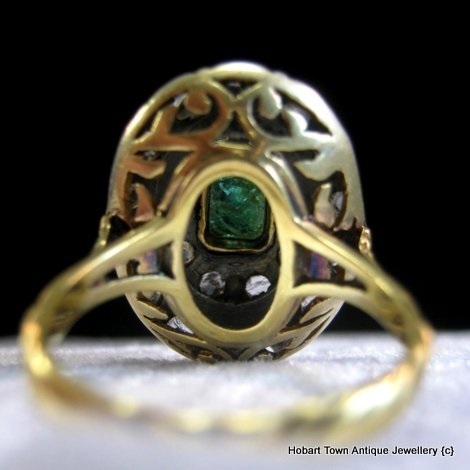 A stunningly beautiful Georgian Emerald & Diamond ring with loads of character & charm ….. ‘soul’ even! It has existed for over 140 years ….. and pretty much anything that has been “used by humankind” ~ Must develop some form of “character” almost. At approx; .50ct the Emerald cut Columbian Emerald is a fine quality natural gemstone which is surrounded by 24 x rose cut diamonds , giving an est; tcw of .75ct’s of earth mined diamonds. Combined with the half carat Emerald ~ there is approx; 1.25ct’s of natural earth mined gemstones in this exceptional 140+ year old ring! With of some the rose cut diamonds catching the light from any angle ~ the ring will always sparkle & shine beautifully. The untreated emerald has a superior colourway , not overly dark or not pale & lacking colour. A fine quality Emerald , hand cut 200 years ago , set in an equally fine ring. 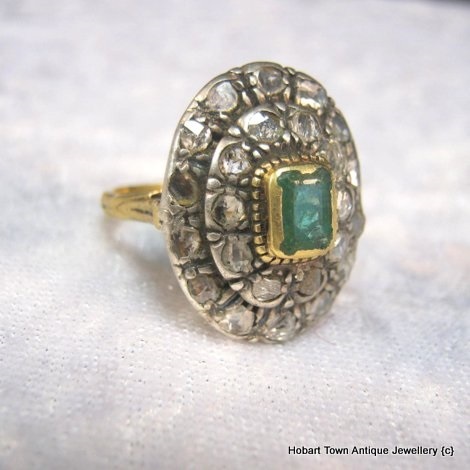 Beautifully made with the gemstones set in silver & 18ct gold to the remainder of the ring , as per standard for the 1820’s , before & after. The Emerald being bezel mounted in 18ct gold , giving a lovely contrast to the setting and also catches the eye. 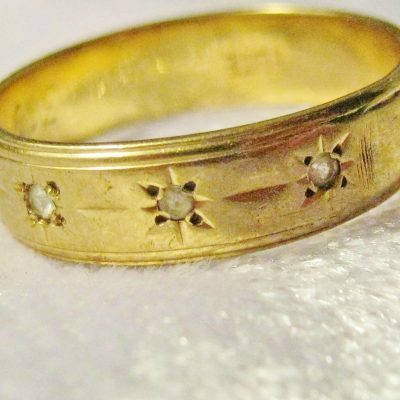 Finely hand engraved pattern to the entire gold band , with beautiful aged wear now providing a very appealing patina & aesthetic ~ as has the entire antique ring! 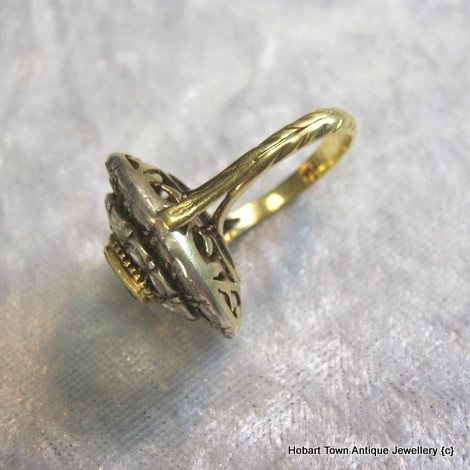 This handsome ring even looks beautiful from the underside ……….. a testament to the superior quality of the ring and talents of it’s maker. Approx’ 20 x 17 mm’s north south , east west. 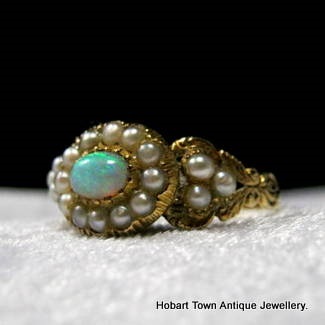 This is a truly beautiful , genuine antique ring , with substance & not just ‘bling & carat weight’ , ~ this oozes style & unrestrained class ~ making this ring look like a $10,000 ring when stood next to or compared with a great deal of rings being sold in Oz around this price!. Yet as we always say & strongly recommend …… please compare our prices to those of any Equal / genuinely comparable item in any shop in Australia. 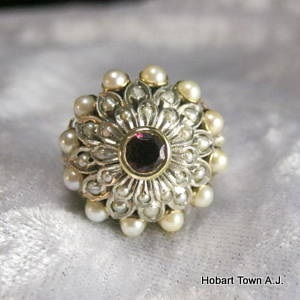 You might be very surprised just how much under priced this classic ring is!! 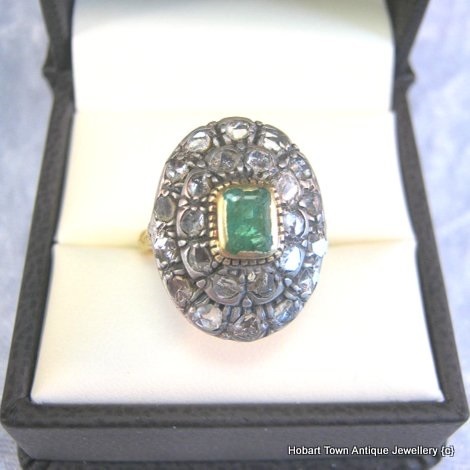 This Stunning Antique 1.25ct Colombian Emerald Diamond 18ct Gold Ring c1820 remains in excellent original condition & again , unlike so many on the market in 2018 , this one has not been changed , converted from or converted to anything. 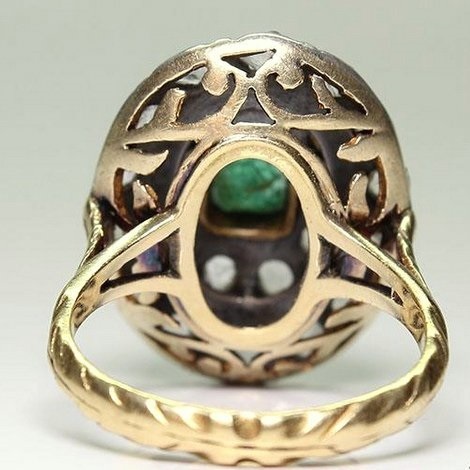 It is exactly as it was made , around 200 years ago and is an exceptional ring ~ which ever way you look at it …………………… and at the great price of au$4,575 ~ well under than au$5k delivered to your door ~ for such a superb quality 200 year old Georgian Neoclassical Emerald & Diamond 18ct gold ring and represents genuinely good value. Note the beautifully made 18ct gold undercarriage , the patterned band , the attention to detail that only quality jewellers went too & was the difference between a good piece & something special. 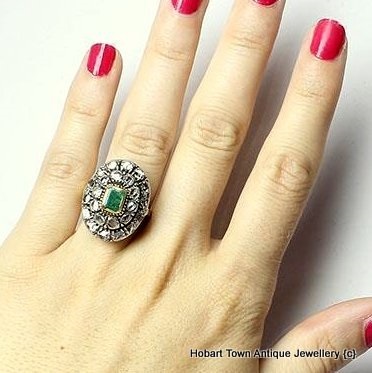 This Stunning Antique 1.25ct Colombian Emerald Diamond 18ct Gold Ring c1820 ticks all the boxes , every single one ~ when it comes to either investing in or purchasing to wear , fine grade antique jewellery. This Stunning Antique 1.25ct Colombian Emerald Diamond 18ct Gold Ring c1820 is one special ring that will make any lover of quality Georgian or early 19thC jewellery proud to own! All enquiries are best asked via email and will be promptly responded , yet do not take too long with this one ……………. it offers excellent value. WE PROVIDED OUR 1st MONEY BACK GUARANTEE TO THE PUBLIC In 1983 & PROVIDE THEM IN THE 21stC STILL.